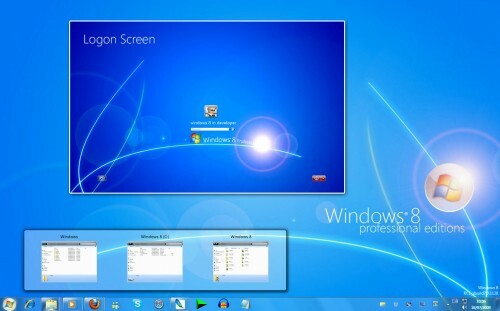 Windows 8 Professional Edition Transformaion Pack tranforms your Windows Vista system into Windows 8 Pro. Today I stumbled upon the latest Windows 8 transformation pack. It looks very similar to Windows vista and Windows 7 but there are many GUI changes like redesigned taskbar, Explorer, new bootscreen and login screen etc. .-= Ajinkya´s last blog ..Download EXACTFILE A file integrity verification tool =-. @ Ajinkya : It will slow down your PC if you will try to run it on XP. .-= Ankit´s last blog ..Now using Chitika with Adbrite! =-. .-= Bimal Roy´s last blog ..DOWNLOAD THE LATEST GOOGLE CHROME THEMES NOW! =-. your doing nice job !!!!!!! should help you to find what you need. i’d like to try this transformation pack, even though that i already satisfied in W7, just wondering the differences of W8. please let me know if you have good URL source, thanks. Its really very better and stylish then Windows-7. and I personally feel that it is some speedy like Windows-XP. so over-all its fine and good. It will slow down your PC if you will try to run it on XP. Great transformation pack. I will be adding it to my PC ! Have you tried it? It’d be a hot topic to postt about, i think you can consider posting some more pics and reviews about the interface. The Login Screen in Center of Desktop gives a Feel of KDE Desktop Environments.